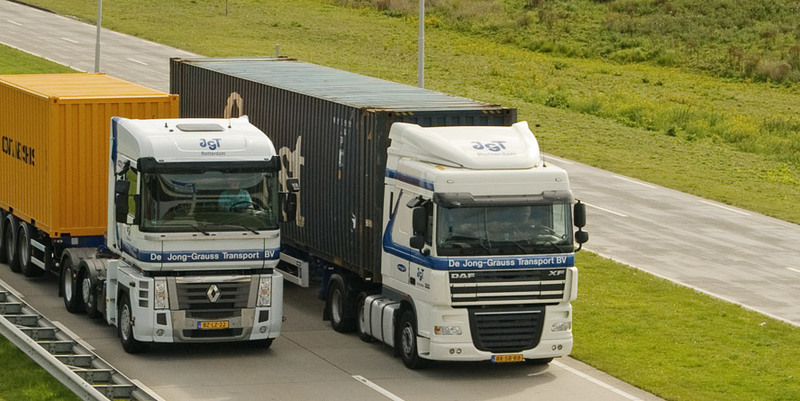 JGT is a specialized transport company for container transport and a reliable employer. The company has a fleet of 160 trucks, 35 of them combinations and 125 trucks. We transport containers of all kinds and sizes: sea containers, tipping containers and tank containers from 20 to 45 ft. The side-loader allows containers to be stacked 2 high at loading and unloading locations. JGT also provides refrigerated transport and waste transport. All of our vehicles are equipped with a Track & Trace system, allowing us to monitor the cargo of the customer at all times. JGT employs a staff of 25 in the office and 160 in driver positions. A personal approach of our clients has been paramount for over 30 years now. The office staff are the links to our customers and ensure that their transport needs and wishes are carried out along the most efficient routes. JGT regularly needs drivers for national and international routes. Our drivers enjoy the challenge, are service-oriented, reliable and flexible. Are you looking for a challenging position in the office or in a dynamic driver's position? Check out our site for future vacancies. Fill in the form below if you are interested in a drivers position. Your details will then be included in our database. Wegens uitbreiding zijn wij op zoek naar ervaren ADR Tankcontainer chauffeur(s).